I have been meaning to write about this for a long time. For some reason, I kept prolonging this piece. Nevertheless, better late than never.So here you go. 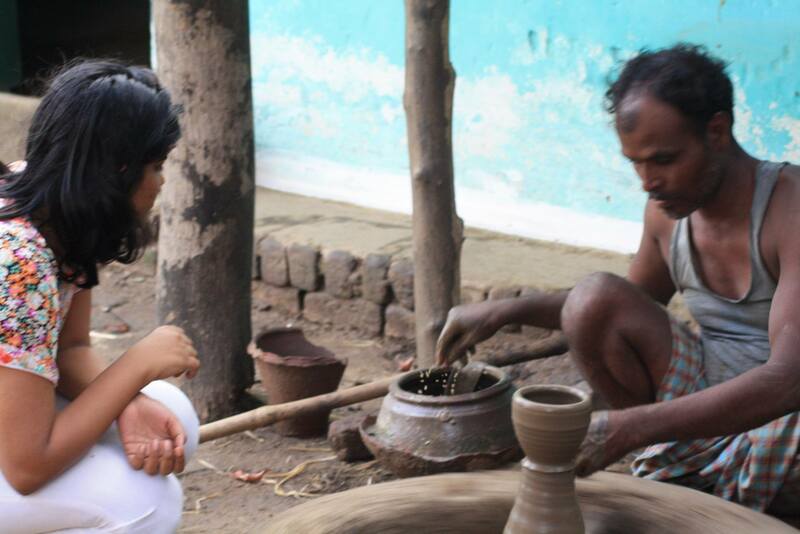 On my recent trip to the wild Pench, I also had the fortune to visit the pottery village of Khawasa in Madhya Pradesh. When I descended from my Gypsy in the village, an eerie feeling gasped me. I could see mud pots everywhere. It seemed, that’s the only source of income for the entire village. On my further investigation it turned out to be true. 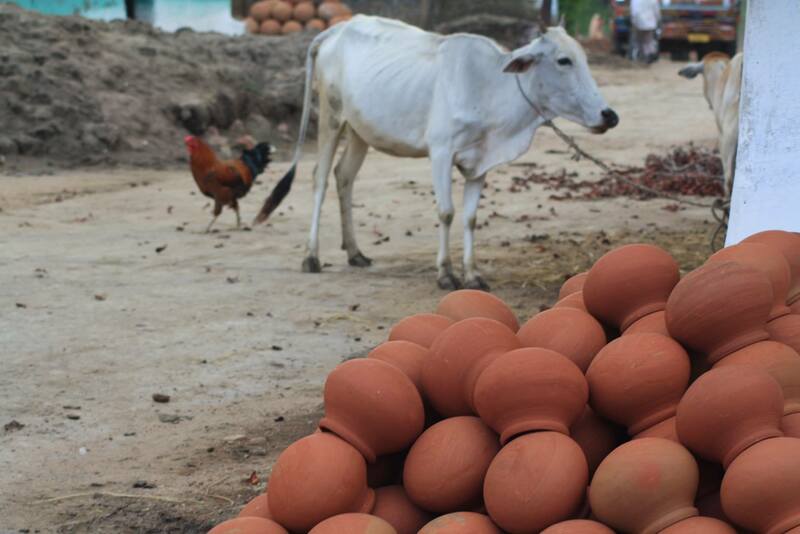 In fact, in every household all I could see was 100s of mud pots of different shape, size and rhythm. As we started deep diving into the remote parts of the village, we were welcomed by Tukaram- a veteran living in the a quaint little blue hut. While he made gestures to us to sit down, I took a serious look at it him from top to bottom and pondered. Here was a man, in as rugged clothes as he could be in, but his favourite accessory seemed to be his smile. The hut seemed to be a muddy place, plastered with blue colour on the walls. The blue colour rendered a very deep meaning to the hut. And a smell of cow dung engulfed the atmosphere. Sometimes, even the pungent smells of these rustic villages makes you feel so close to home! I never had experienced such a smell in the city of Dreams- Mumbai. But, this seemed to intoxicate me with the feelings of happiness and satisfaction. I did require nothing here. No ipods, no TVs, no laptops. The people, the village, the roosters with their coarse calls, the simple people offered the best of everything, which a city could not afford. With these thoughts pinching my throughout, I entered my master’s classroom- an open veranda. It was in this place that Tukaram sat and perhaps created some of his best artwork. Sensing my uneasiness, Tukaram announced “You’ll have fun. Don’t worry! Come.” And as if a rehearsed magic wand had appeared from somewhere, I jumped at the wheel and started working on it. When I first touched the mud, the softness of it befuddled me. How could such soft mud turn into a kitchenware I wondered. The wheel confused me further. I tried asking him the importance of the wheel. Somehow my Hindi was so pathetic that he perhaps decided to answer it only with – “Yes, yes, the wheel helps.” Though, I couldn’t exactly make out much of the wheel, but I guess it helps to shape the mud as and when the wheel spins. 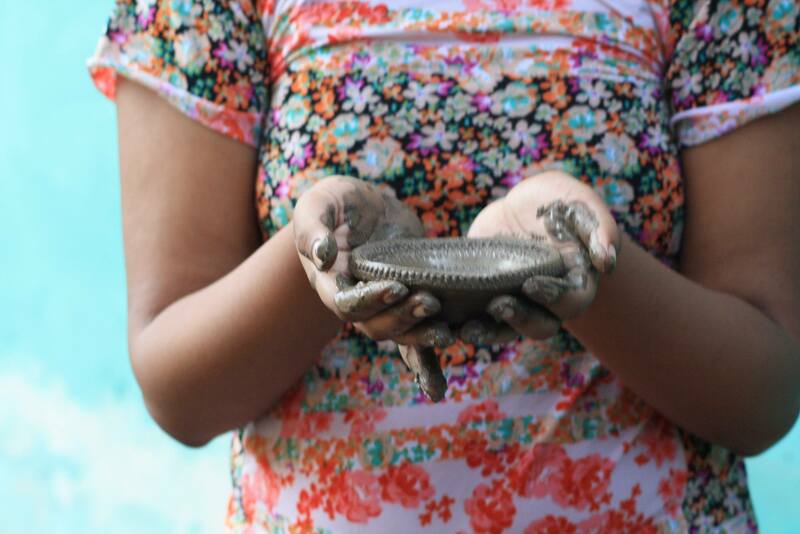 The mud rolled out further on my hand and it felt like a soft cutter pierced my hands. But it was surely fun. 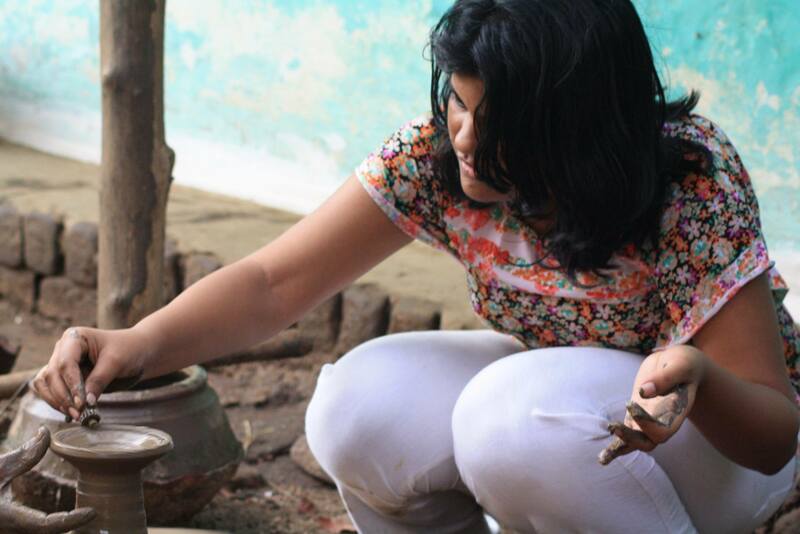 The trick in pottery, is then Tukaram told me “Don’t put pressure on the mud. Just put a light force on the mud and let it take its own shape. It’s an art. You’ll master only with practice. “KABOOM!” I was surprised to hear those pearls of wisdom from Tukaram. 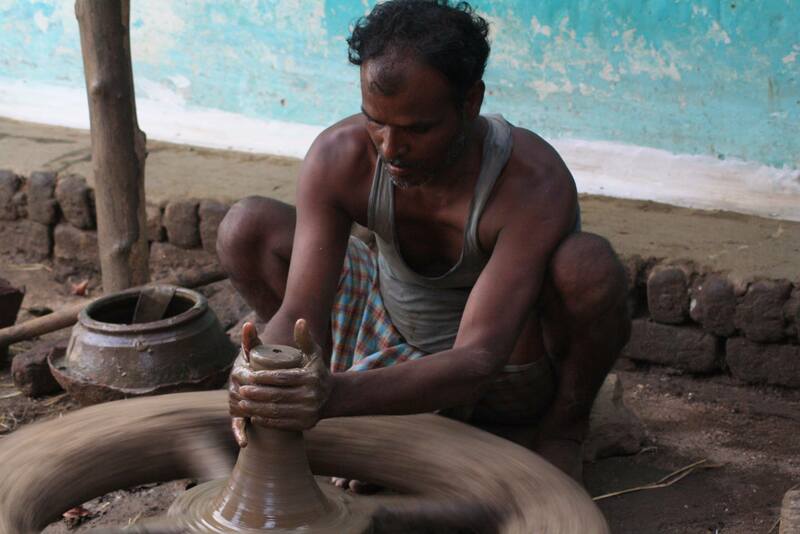 Here was a potter, whose generations of family have earned their livelihood only from pottery. And this man believed, there is no science to pottery. It’s only an art that is mastered! Almost an hour passed by. I was still struggling with creating a pot that wouldn’t break. Sensing my urgency, a man passing by exclaimed- “Madam, ek din mein nahi banta.” (This cannot be made in a day.” Tukaram then further added that, their lifetimes pass in mastering the art. 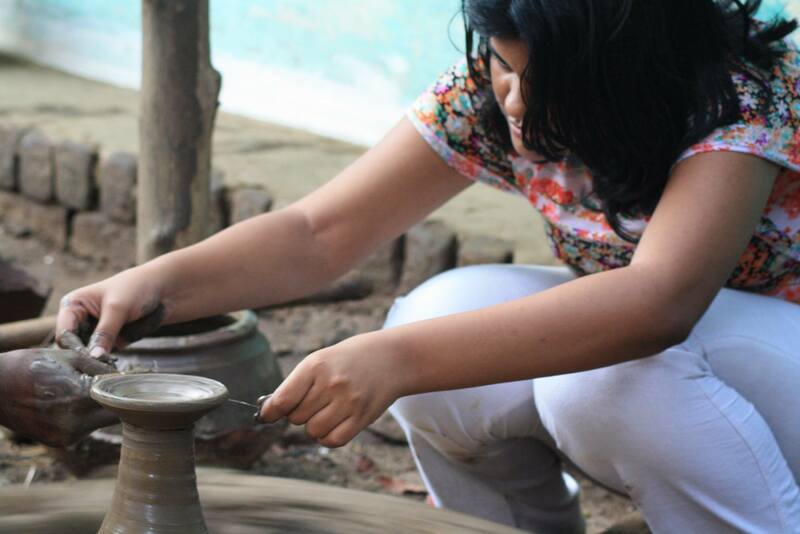 As potters, they have been trained at it right from their childhood. 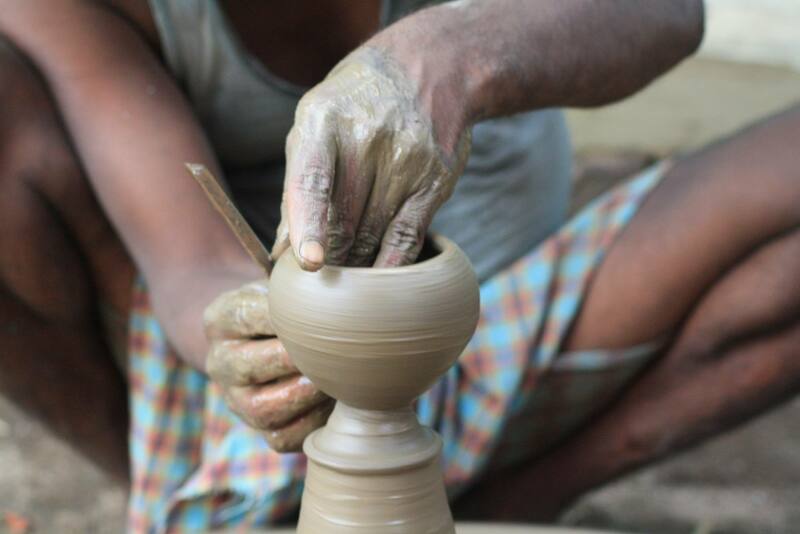 When I asked them how much a pot or a mud vessel earned them, Tukaram said a meagre of “20-30” rupees per pot is what he made. I was taken aback. Such a beautiful piece of work earned them meagre money, but the smile they exuded seem to give lessons in satisfaction, humility and gratitude. A special Note: This trip was possible, on the invitation of WelcomHeritage, a joint venture between ITC Ltd and Jodhana Heritage that represents some of the best traditions of heritage hospitality and tourism in India. 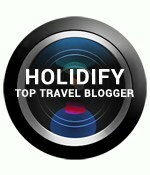 It offer’s over 40 exclusive heritage destinations, ranging from grand palaces to traditional havelis and magnificent forts; quiet nature resorts in Rajasthan, Madhya Pradesh, Uttarakhand, Himachal Pradesh Jammu & Kashmir, West Bengal, Karnataka, Tamil Nadu, Punjab, Sikkim, Uttar Pradesh & Goa. In Pench, we stayed at WelcomHeritage’s Jungle Home. This entry was posted in culture and people, eco-tourism, India, Leisure, Maharashtra, Must visit places, Pottery, Resort, Travel, Weekend, Wildlife and tagged art, Khawasa, Madhya Pradesh, Pench, Pottery, science, tiger reserve, Weekend, WelcomHeritage. Bookmark the permalink.